The blogosphere is ripe with women who started blogs and soon were awarded book contracts. Some that come to mind are Amy from Mom Advice who released her book, The Simple Life for Less, last year and Crystal from Money Saving Mom who wrote The Money Saving Mom's Budget. What we tend to hear less of is men who blog and get a book deal. 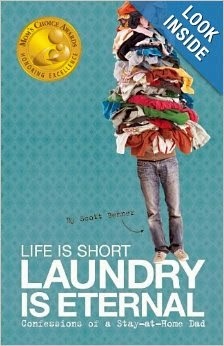 However, Scott Benner is breaking that barrier with his new book, Life Is Short: Laundry Is Eternal. Scott Benner is a stay at home dad to two children, one of whom has Type 1 diabetes. He blogs at Arden's Day about his daughter's journey with Type 1 diabetes and recently released his book. To be clear, unlike many other book reviews on this blog, this book only deals with working from home in the periphery. Benner is a work at home dad who blogs, and now he is also doing national television interviews about his book. However, the book primarily is about being a stay at home dad. Life Is Short: Laundry Is Eternal ? This book has two primary focuses. First, Benner argues that family is most important, and everything else is secondary. Second, he offers women interesting insight into what their husbands are thinking. When I quit my full-time job to become a work-at-home mom, my primary reason was because I wanted to stay home and take care of my kids and not miss out on their everyday life as I thought I would if I was working outside the home. However, as my work responsibilities grew, I increasingly felt torn and slowly fell into the pattern of putting work first. My guess is that this happens to many women who work from home. Benner's book is an excellent reminder why most of us wanted to become work-at-home moms in the first place. Family should be the primary focus. Benner has excellent insight into this, especially after his daughter was born and had several near fatal incidents thanks to her Type 1 diabetes. We always know in the back of our minds that there are no guarantees that all of our family members might be here tomorrow, but Benner is living that on a daily basis. From this view, he can, and does, remind us why we wanted to stay home in the first place. He brings priorities clearly into focus. On a much more humorous note, Benner, as a stay at home dad, is in a unique position. He's a man, so he knows how husbands feel, but he spends part of his day around stay-at-home moms, so he understands how they feel, and he provides a listening ear. Thanks to this dual position, he offers women excellent advice about their men. Most of this advice is humorous and yet dead on. This book likely won't help you become a better businesswoman, but it may very well help you become a better mother, or at the very least, appreciate your family more. If you want a reminder why you became a WAHM in the first place, you'll enjoy and appreciate this book. Get it from Amazon in both paperback and digital versions!